Lance Corp. Wm Pitt, 1st Field C. Engineers, late of G.P.O. 19 year old “Billy” as he was best known, was a Carpenter from Paddington and was already serving in the 5th Field engineers prior to enlistment. 119 Spr. 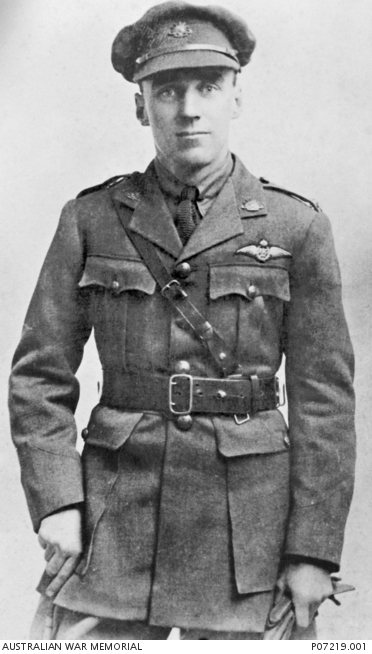 William “Billy” Pitt gave his account of the landing at Gallipoli and the work accomplished by the engineers from a Cairo Hospital to his parents in Paddington, NSW which was later published in the Sydney Morning Herald…………. “The task of removing the wounded was a very formidable one. The engineers where then called out of the firing line, and set to work making a road up the hill to the firing line. We worked for two days and nights without any sleep, but each man knew what the job was for, and worked with all his might. After Gallipoli, Billy would later be engaged in the fiercest battles the Australian Imperial Forces had seen at the Western front, and sadly this is where Billy would spend his final days. 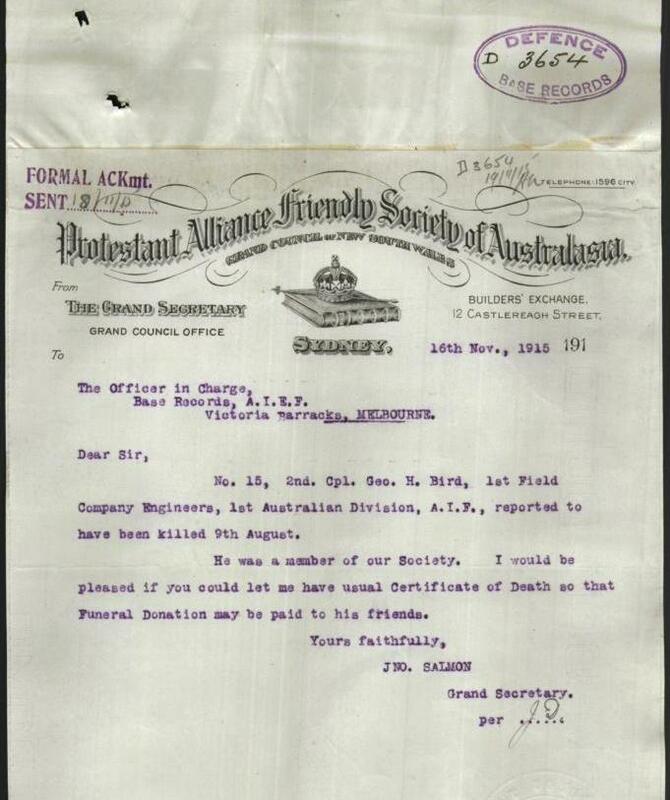 Wounded, then declared missing, then later declared “died from wounds received in action”, his body was never found and no place of burial discovered. His remaining personal effects were also lost at sea. An undeserving end to the heroic life of Billy Pitt……………his personal page is available to read…..Click this link. Photo Source: GPO original locations or series – St6231 -Information from NSW Government Printer – Copy of original photograph. On plate 8 1/2 x 6 1/2. Note in Register: Killed at Paschendale, France. The following news article was written by S.W. who’s identity remains a mystery however he was very likely a WW1 veteran convalescing at the home of 147 Spr Frank Cluett and his wife Mabel. It is a wonderful tribute to a fine couple who despite their own difficulties after the war, openly shared their home helping others in need. 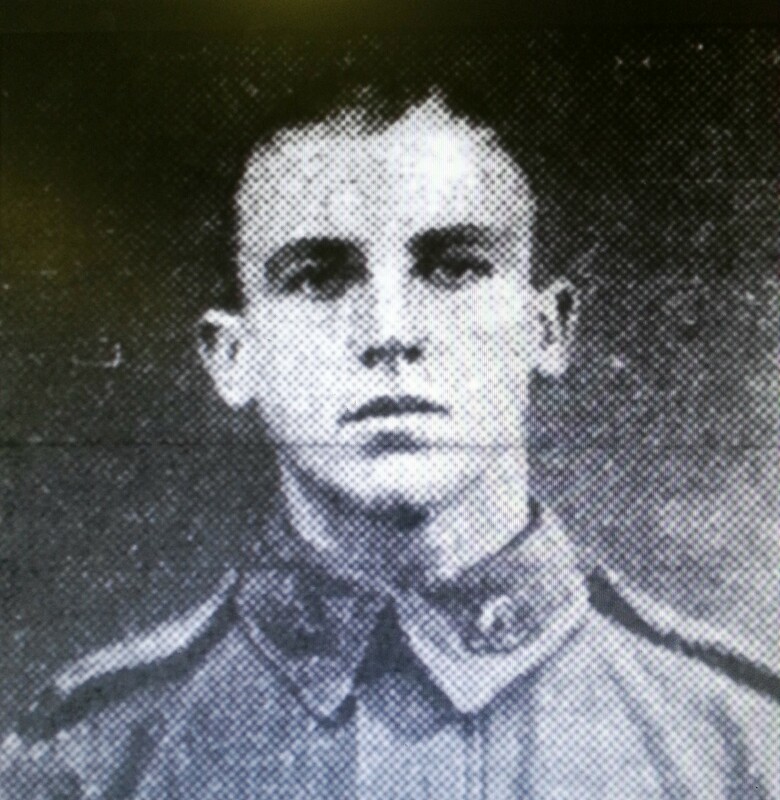 20 Alexander Finnie was a 21 year old sheet metal worker and was employed by the Randwick Tramway department. His proud parents living at Botany were Alexander James and Ida Jane (nee Bullock). 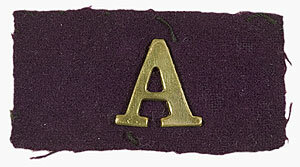 Alexander also had an older sister who unfortunately died in 1911. 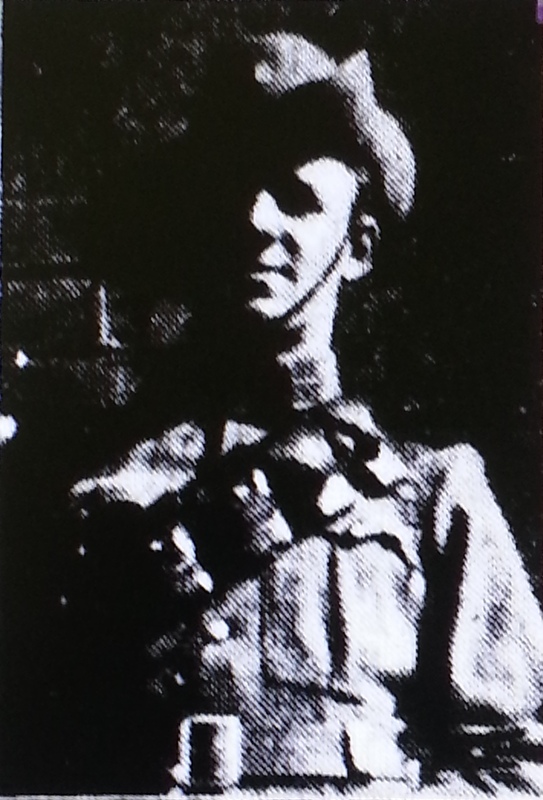 Alex served almost 3 years in the 1st Field Company Engineers and had a long stay at Gallipoli up to the 18th August. A near miss from a shell blast and gas poisoning meant that he was transferred to hospital in Alexandria, quite sick and suffering from deafness. Like many others Alex was keen to recover and get back into the fray, and he did, but this time he would do it from the sky as a flying officer. 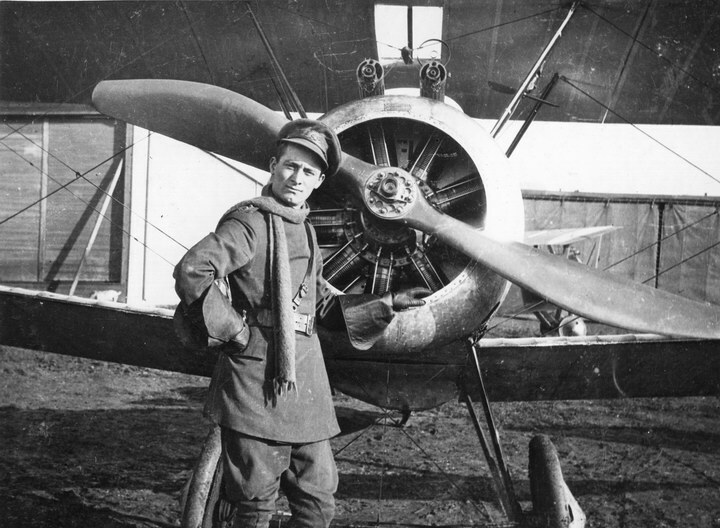 Alex had transferred to Flying school in England and graduated as a flying officer and was appointed 2nd Lieut and posted to the Australian Flying Corp. Now wearing his wings he proceeded overseas to France and reported for duty with the No 4 Squadron AFC, the last squadron to be formed during the first World War. On the 22nd May 1918 Lieut. 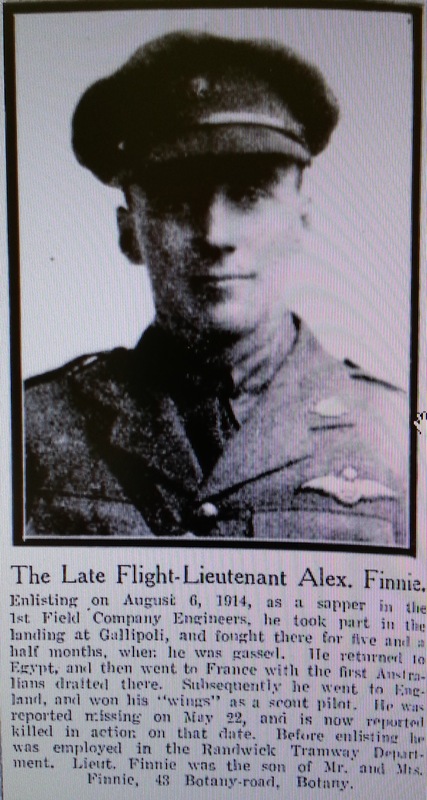 Finnie was on his usual offensive and balloon patrol in his Sopwith Camel No. D1924. Enemy observation balloons were stationed thousands of feet in the air and tethered to the ground and fearcly protected by machine guns and anti-aircraft artillery known as “Archie”. 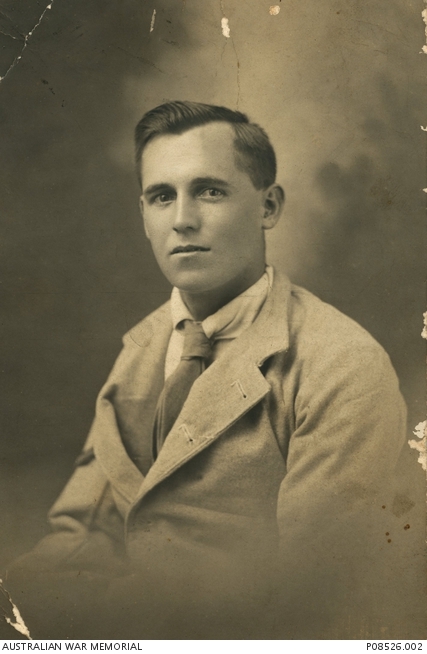 Walter was a 19 year old carpenter from Merewether, Newcastle NSW, a community that had shown vigorous patriotic support for the war effort. 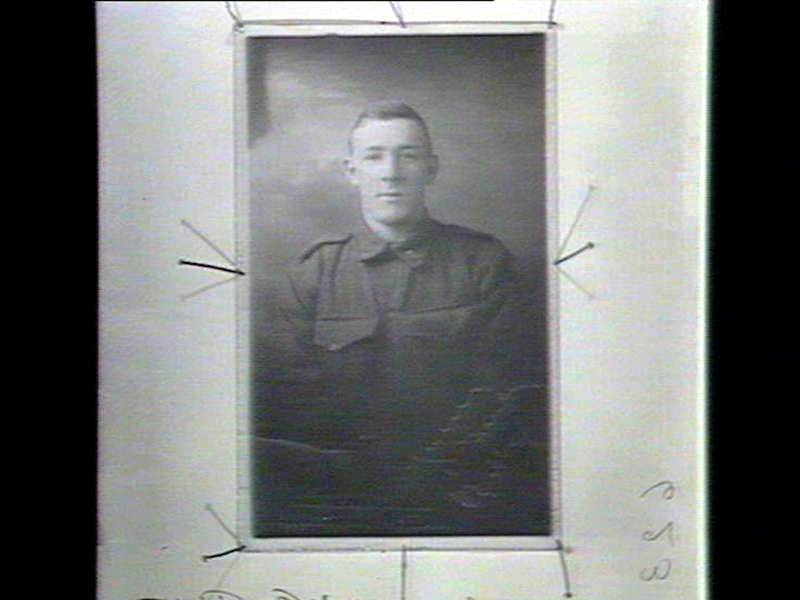 The photo above is courtesy of the AWM, a pre-enlistment studio portrait of Walter Stallard clearly showing a “presence and cool demeanour” which would serve him well during the entire World War 1 campaign. 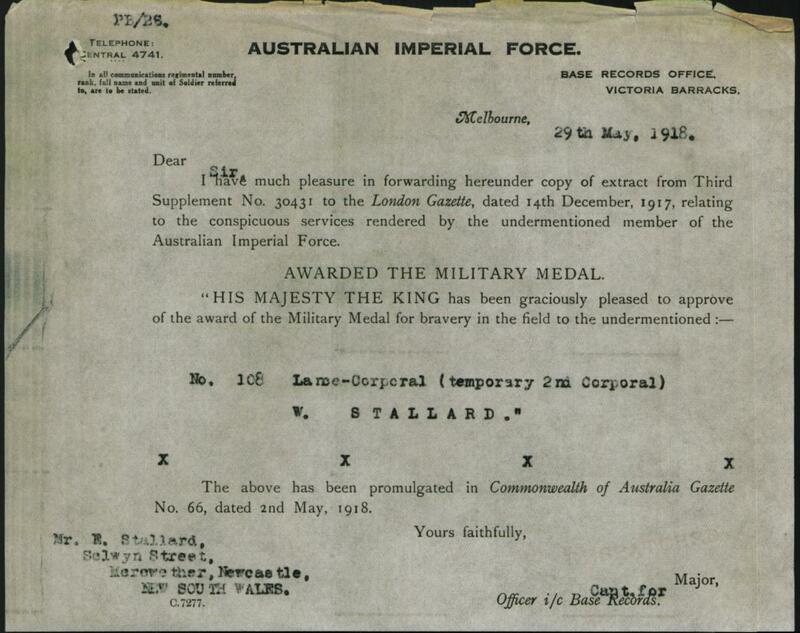 Walter Stallard enlisted on 22 August 1914 and embarked with the 1st Field Company Engineers from Sydney on HMAT Afric on 18 October 1914. 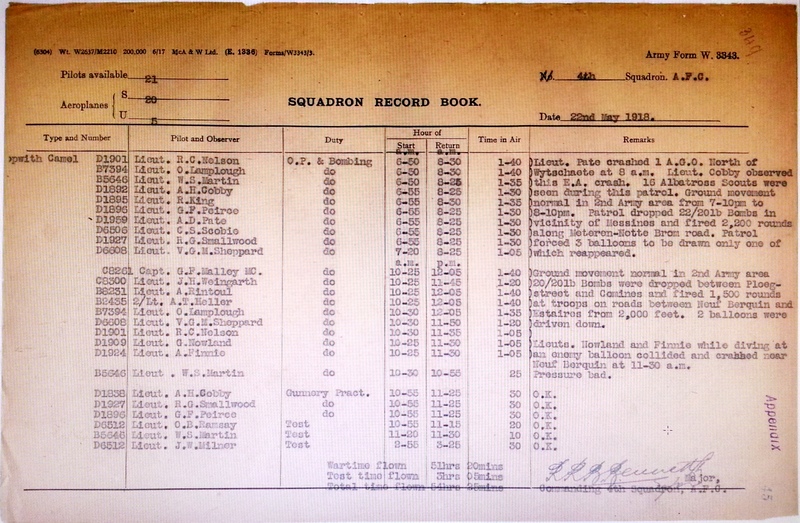 Apart from being a “Dawn Lander” and one of the first Novacastrians to set foot on Gallipoli, Walter had managed to dodge both snipers and illness right up to the 8th August 1915. 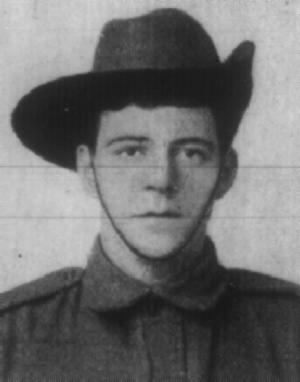 On the 8th August at the Battle of Lone Pine young Walter was wounded by shrapnel in the arm and also suffering from shock, he was transferred to hospital in Mudros. His fellow sapper 107 John Slattery was wounded the previous day, but Walter would have been completely unaware that John would die from his wounds and was buried at sea on this day. This would not be the only major battle for young Walter, and not the only time he would be wounded in action. Each time Walter was wounded he would recover and return to the field and some of the fiercest battles that the Anzac’s had seen. 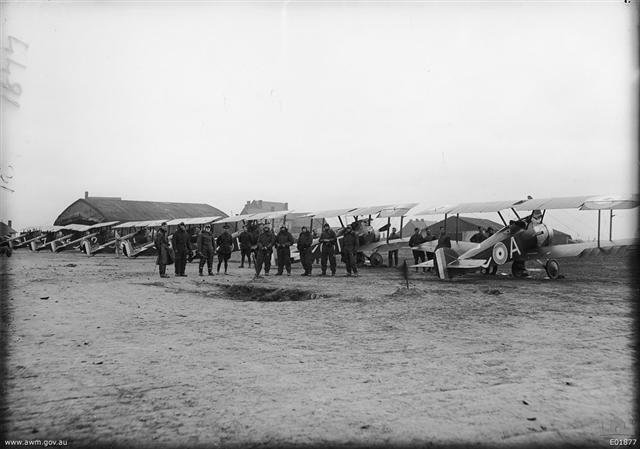 Walter Stallard first on the extreme left of the photo above – Mudros 1915 – An Evelyn Lloyd photo. Pozieres, is a small village in the Somme Valley in France, and was the scene of bitter and costly fighting for the 1st, 2nd and 4th Australian Divisions in mid 1916. The Battle for Poziers was considered the heaviest bombardment that the allied forces had ever seen in the entire war. It was 7 weeks of continual shelling day and night. On 1st June 1916, Poziers, Walter was wounded a second time, a gun shot wound to his right thigh and his face and this time he was transferred back to hospital in England to recover. Within four months he had fully recovered and in November 1916 he returned back to the field in France. The following is an excerpt from “Cameos of the Western Front” – Ypres sector 1914 – 1918 by authors Tony Spagnoly and Ted Smith, it describes the scene that the Anzac’s faced the morning of the 4th October 1917 at Ypres. The land they were fighting over had been held by the Germans since 1914. 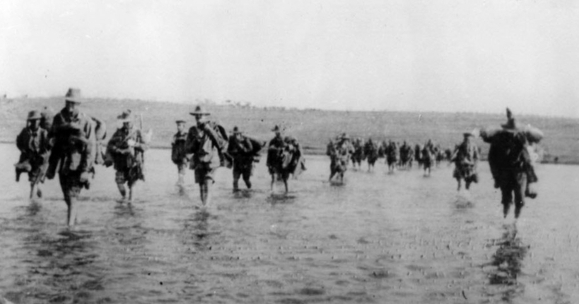 “In the early hours of the 4th October , the mass of 1 and 2 Anzac lay crowded along the front line, with a fair proportion of the men placed nearer to the enemy positions than would have been favoured by the planners. Due to the large area of boggy Flanders mud……..several units had to be positioned close up to the enemy lines. Unseen before them , in the dark along the lower slopes of the Broodseinde ridge, lay several fortified farms the enemy would bitterly contest…………………………..the Australians planned to attack at 6.00 am , but about 5.30 am, as they were quietly waiting………Desultory German fire, which had been falling intermittently among the Australians, grew in intensity…..observers further back , grew tense with worry and anxiety. The enemy fire increased pummeling the front line troops…..and British gunnery supports further behind the line. had the enemy anticipated the proposed advance ?. On this day the 1st Field Company Engineers would be recognised for their enormous contribution to the success of the day. 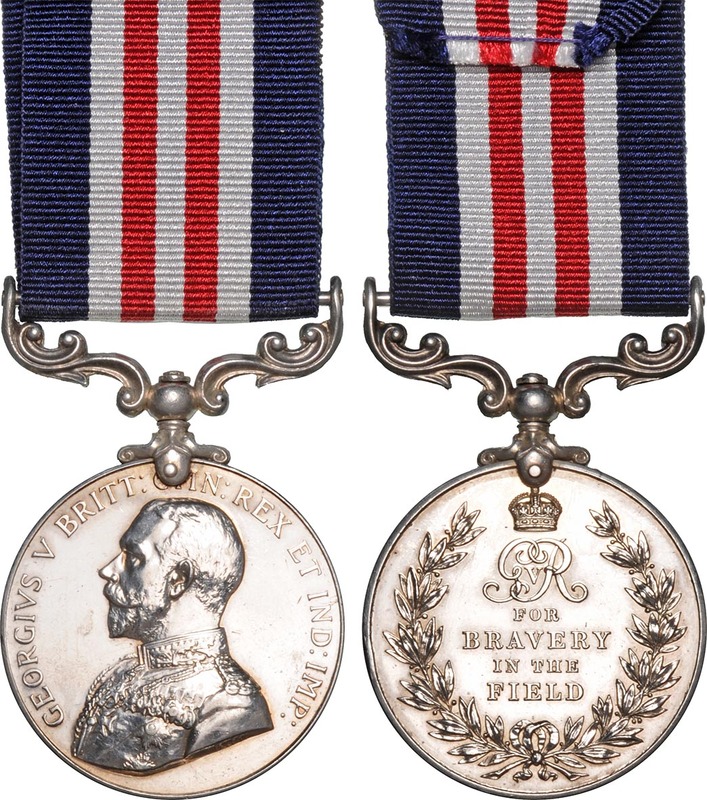 The Anzac’s had once again displayed unswerving determination and bravery in this attack and six original members of the 1st FCE would be awarded the Military Medal, 66 Norman Masters, 99 John Jackson , 119 William Pitt, 153 Phillip Charmichael, 67 Albert Currie and 108 Walter Stallard. 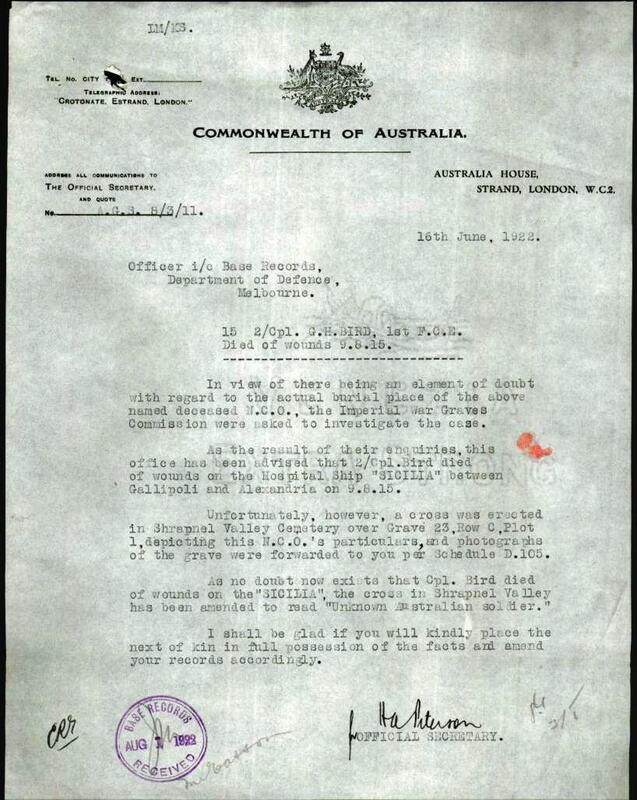 Two Australians from the 3rd Division were also awarded the Victoria Cross, such was the significance of this battle. The following is the official citation for 108 Walter Stallard. 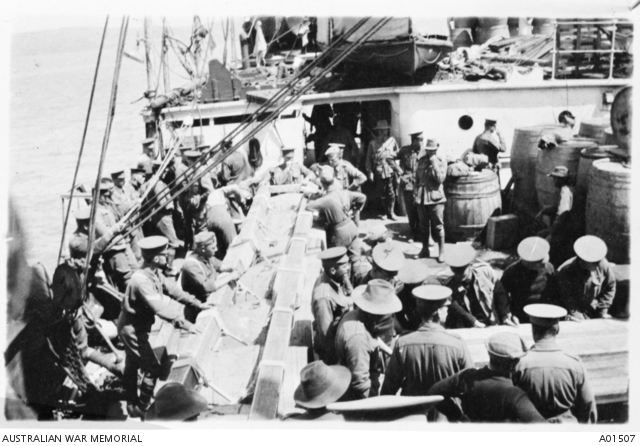 The indestructible Walter finally returned home to Australia on the troop ship Port Sydney (formerly the Star of England) on the 2nd December 1918. He was lucky to share the journey home with some of the original sappers who had all signed up together 4 years earlier. On the same troop ship were nine of Walters mates, the equally indestructible 174 Everleigh Hodges MM, 12 Thomas Rose, 42 Roland York, 38 William Smith , 250 Fred Wicks DCM, 130 Leonard Johnstone, 177 Reginald Jessop MSM , 176 William Harvey, and 207 Norman McKee. For these men who had survived four hard years at war, it must have seemed a lifetime ago when they last left the shores of Australia. It is impossible to imagine their thoughts and stories they must have shared on that return trip. But no doubt the journey would have been a welcome respite, filled with anticipation of the reception they would receive when they finally landed home on Australian shores. The Merewether community were eagerly awaiting Walter’s return and anticipated his arrival on Saturday 30th November and had prepared a celebration for Walter and other returning soldiers. Walter’s arrival was delayed in Melbourne and the celebrations for Walter were simply postponed and it appears even more effort went into a more formal reception for this brave young man a few days later when he arrived by train. 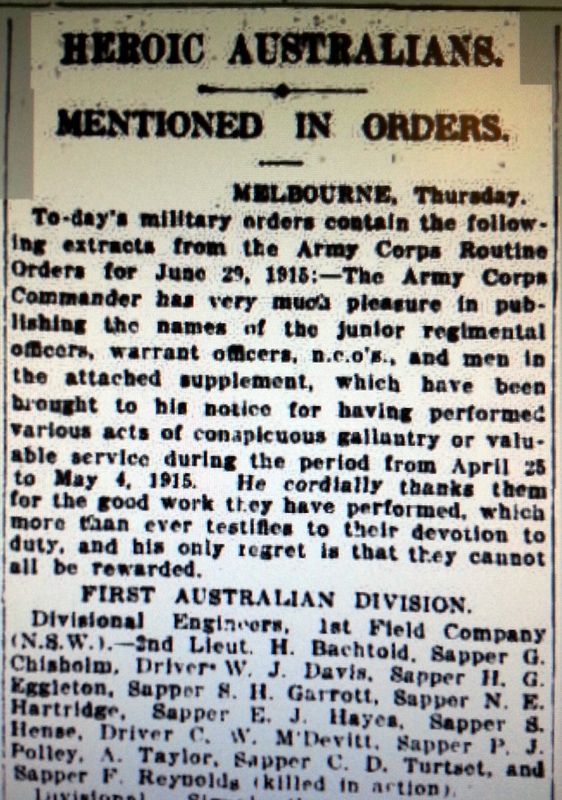 Published -Newcastle Morning Herald and Miners’ Advocate – Friday 6 December 1918. “Corporal Walter Stallard, a returned Anzac, was officially met at the Newcastle Railway Station last evening, where two motorcars and municipal representatives, a number of relatives and friends, were in waiting. Corporal Stallard joined the car with Alderman R. Wells, the Mayor, and Mr. T. Adams, the town clerk, and was conveyed to his father’s residence, in Alworth street. Prior to leaving the railway station, Alderman R. G. Kilgour, the Mayor of Newcastle, welcomed Corporal Stallard, on behalf of Newcastle, and wished him long life and prosperity. There is a strong sense that Walter was very much the “quiet achiever”, perhaps a man of few words but a determined young man who didn’t shy away from danger and maintained that cool demeanour and bravery through to the end. 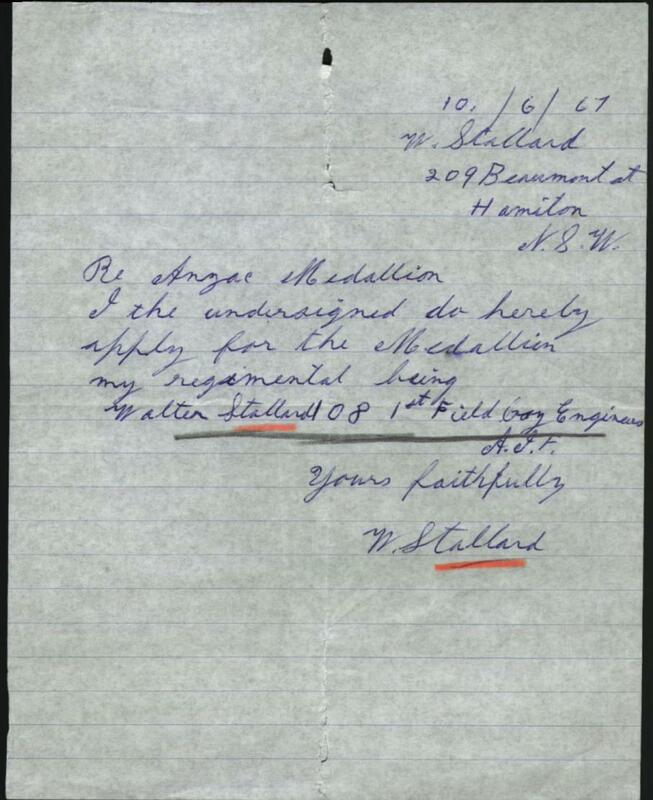 His hand written application for the Gallipoli Medallion in 1967 is possibly the simplest and shortest hand written letter this researcher has found. 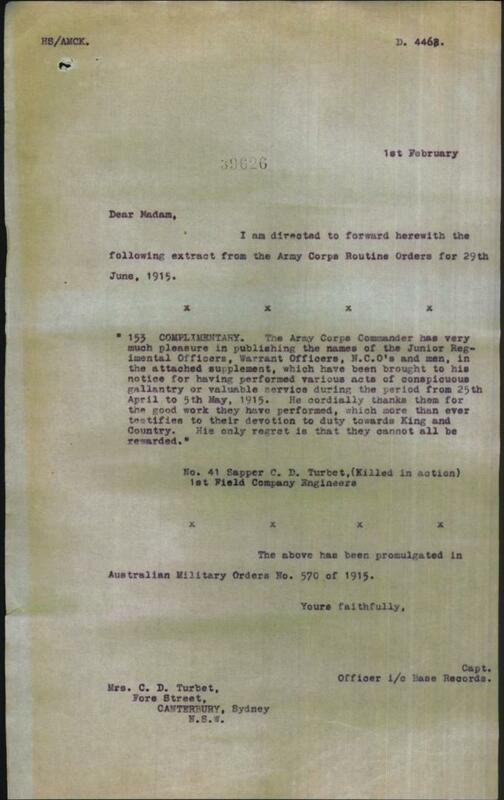 A simple request with his regimental details and no mention of his Military Medal. Walter’s quiet modesty was so typical of many of the Anzac’s and perhaps characteristic of his approach to life after the war. 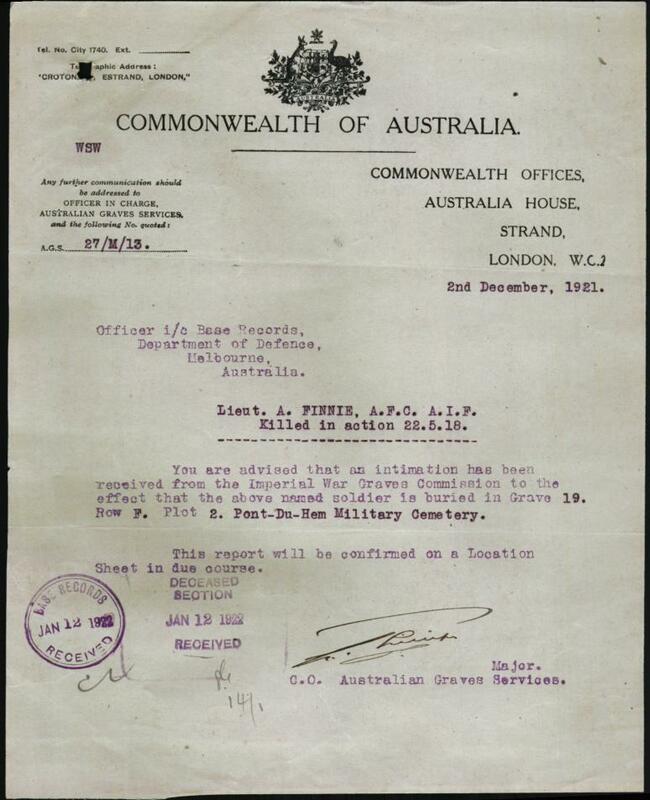 Walter lived a long life and passed away in 1981, he was a great Australian. 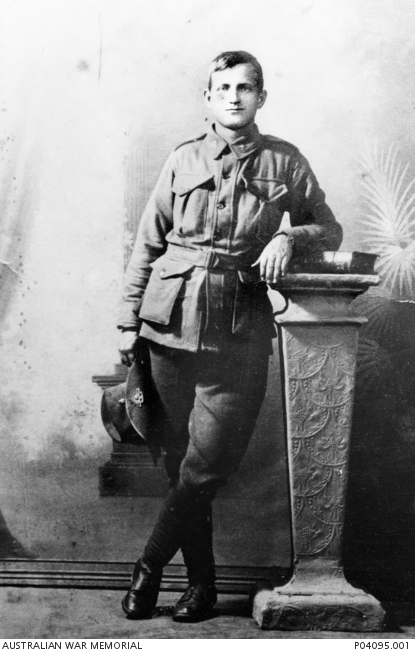 41 Claude Douglas Turbet was only 19 years old, born in Hobart, Tasmania. His parents were William and Annie (nee Cook) – Before enlisting he had made a career for 3 years as a mattress maker in Kent st, Sydney with Good Earls Ltd. 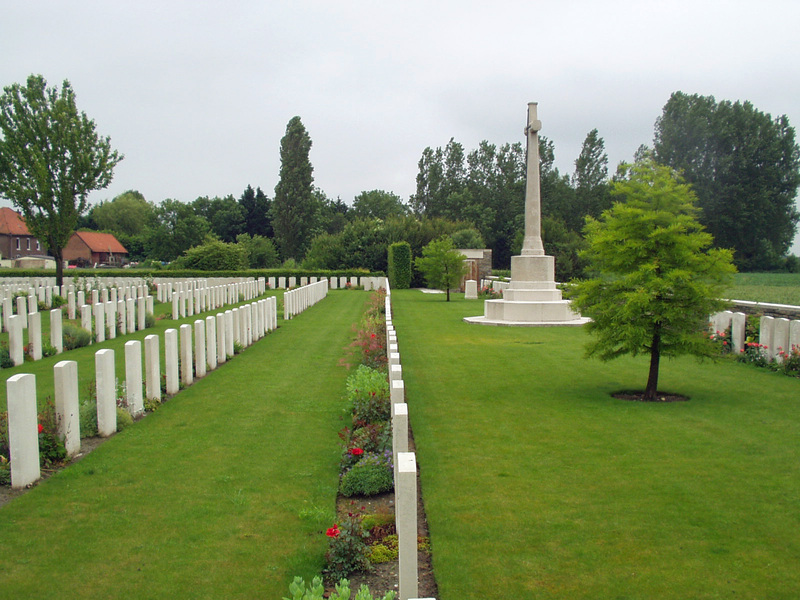 He was living with his mother at Canterbury and was already serving in the 6th Field Co. Eng. Claude had three brothers, Harold , Charles, Robert and his sister Ivy. Claude was one of the original pontoon builders with Lieut. Henry Bachtold on landing day at Gallipoli and received special mention for acts of conspicuous gallantry and valuable services. 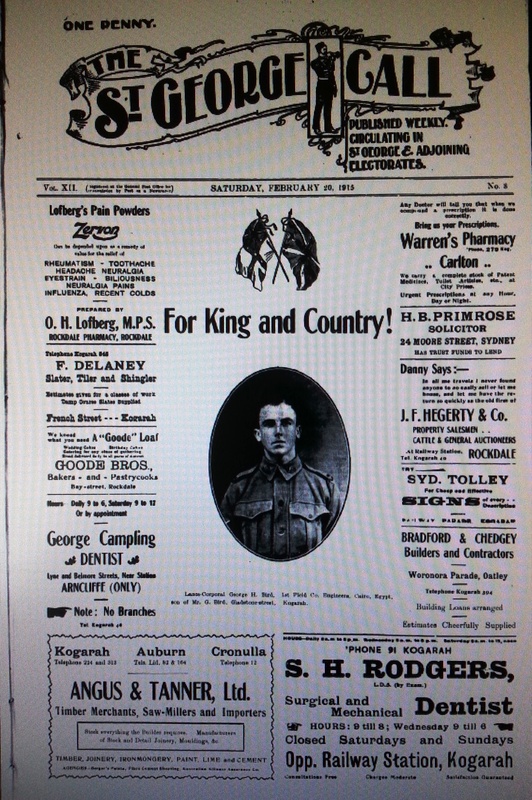 Claude’s heroic efforts on the landing day with his fellow sappers was published in the Sydney Morning Herald on Friday the 22nd October. The headline read “Heroic Australians” and Claude was “Mentioned In Orders” by the Army Corps Commander with his fellow pontoon builders. Unfortunately his name was spelt as C.D Turtset in the SMH. Unfortunately his name was spelt as C.D Turtset. 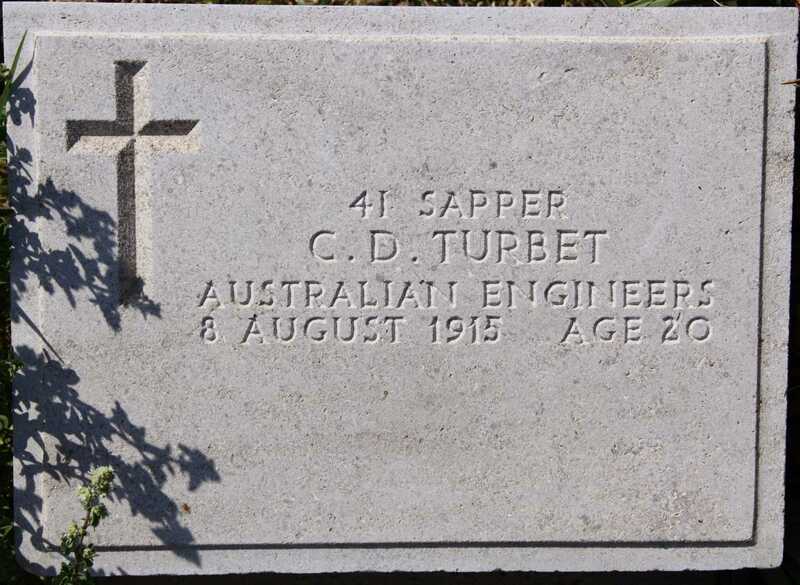 On the 8th August at the “Battle for Lone Pine” Claude Turbett was “Killed in Action” . Fellow Engineer 151 Ernest Murray wrote in his dairy that poor Claude was practically blown to pieces by a shell. Claude Turbet’s burial was officiated by Chaplain Walter Ernest Dexter. None were more aware of the human suffering at Lone Pine than the chaplains and padre’s who worked constantly to lift the spirits of the men in the trenches. 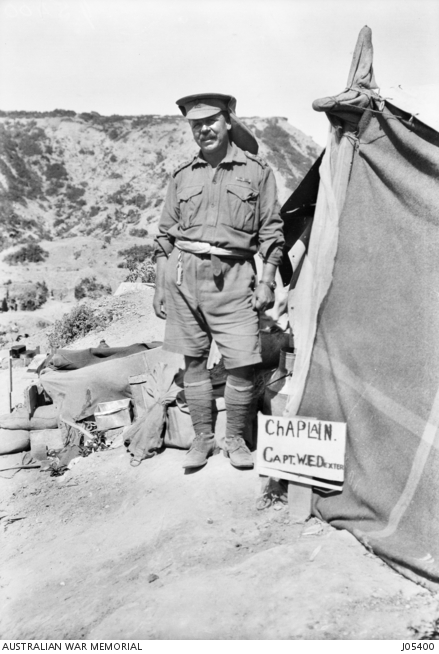 Chaplain Walter Dexter’s diary reveals the conditions that prevailed during and after the attack at Lone Pine. His entry for Tuesday August 10 reads………. On the 3rd August, just 5 days before Claude was killed in action, Claude’s brother Harold was wounded at Gallipoli by a bullet wound to the arm. 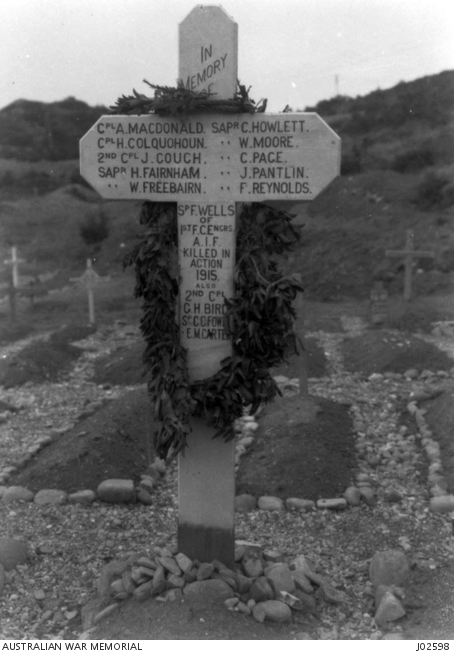 The day after news of “The Brothers Turbet” was published in Australia , Claude’s brother Harold embarked for Australia carrying his wounds and a heavy heart with the loss of his brother Claude and the knowledge that he would have to return home without him after leaving together on the HMAT Afric just 12 months earlier. Published in Sydney Morning Herald. TURBET.-In loving memory of my dear brother and brother in law who was killed in action on the 8th August 1915, at Lone Pine. In a heroes grave he lies. Inserted by his brother and sister-in- law, Mr and Mrs C W Turbet. Will never distress him again. Inserted by his sorrowing brother and sister in law, Harold and Rose. Location on the Roll of Honour Claude Douglas Turbet’s name is located at panel 25 in the Commemorative Area at the Australian War Memorial (as indicated by the poppy on the plan).